Welcome to Falcon Kayak Sails! 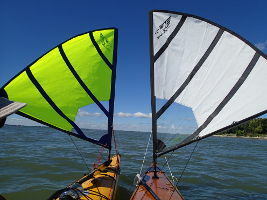 Here at Falcon Sails, LLC our focus is making the best kayak sail kits on the market. Our product, knowledge and service will lead you to an amazing kayak sailing experience. 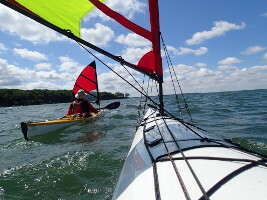 Our kayak sail kits include everything you need and are easy to install on any kayak. You can have amazing sail performance and simplicity in a compact, light weight kit. A complete Falcon Sail with rigging kit weighs only 3.5 pounds and can be rigged at the launch site in 30 seconds. An efficient air foil shape provides maximum sailing potential on all angles of attack. You can actually sail up wind. The Falcon Kayak Sail rig can be lowered and secured to your deck in seconds (without going to land) and raised in seconds when you are ready. Our sails are made of the best sail cloth available and our carbon fiber mast stiffness makes it so increased wind equates to bursts in speed, not lost potential. Even with this great performance, they are as easy to handle as any kayak sail on the market. Our goal is to provide kayakers who are looking for performance features in a lightweight, compact and easy to use kit. We are so confident you will be impressed, we provide a 30 day money back guarantee on everything we sell. 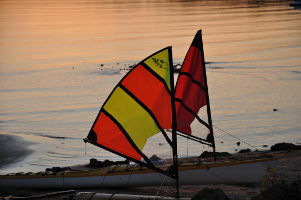 If you have any questions about kayak sails or kayak sailing, give us a call or send us an email. We will be happy to answer all your kayak sailing questions! Design a Custom Sail Now!